Ghosts'n Goblins (Makaimura, "Demon World Village) is a plataform game, released by Capcom in 1985. In this game you must control knight Arthur through several stages to save his beloved, kidnapped by a messenger of satan. In the original game, Arthur must defeat 6 guardians, passing thru 7 different stages, and then defeat satan. But Arthur will not face these monsters without weapons: he has five different weapons to help him. 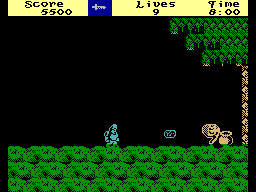 Better known as one of the hardest games ever, the game was ported to several computers and videogames and had three official sequels: Ghouls'n Ghosts, Super Ghouls'n Ghosts and Ultimate Ghosts 'n Goblins. Some of the game characters were also used in other games, such as Gargoyle's Quest, Maximo and Makaimura for WonderSwan. Even if it was a great classic of the 80s and being present on most home computers at that time, Elite had never ported Ghosts'n Goblins to MSX... but this injustice has come to an end! Amusement Factory Software presents its first full ZX Spectrum 48 game conversion to MSX! 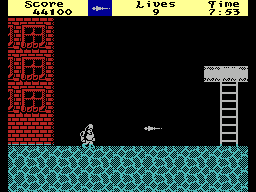 The ZX Spectrum game was not perfect: it has the classic color clash problems, not all stages are present (only 3), and the game only implements three weapons. The game was almost mute, also... but this was something we could fix! It is worth to mention that the game was somewhat CPU-intensive and since MSX has to do a lot more work than the original Spectrum (to run a Spectrum game, of course! 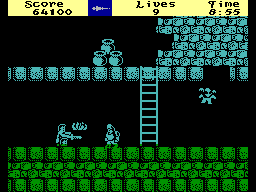 ), the game runs on 3.57MHz MSX computers (with some limitations), but it is needed a full 7MHz computer (or better) if one wants to play in full speed. But the MSX version has some good enhancements, like the progress map (from arcade) and also exciting music themes (one for each stage!). Anyway, it is nice to say that the fans of this classic will be able to run it on their own MSXs... finally! # Ghosts'n Goblins 1.1.0 released! This version corrects a bug that prevented the game from being run on real MSX1 computers (Ha! There is no perfect emulator!). # Ghosts'n Goblins 1.0.0 released! # The first version of project's website is online!